I’ve had all I can stands. I can’t stands no more. Pitch framing should no longer be a thing. What you’re saying is 100% on target, and by that I mean, a strike. Or is it a ball? Who knows! There’s no way of telling! I appreciate when catchers are good at framing, because they are taking time and effort to do something to help their team in a real way. Good on them! As a mildly psychotic Cubs partisan, I wish Willson was better at framing. And by framing, I mean fraud. Forget animals in the clubhouse and karaoke contests—at this point, Joe Maddon should have special guest David Blaine in to work with Borzello & Co. It’s very silly, but I’m not 100% sure it wouldn’t be helpful. LEN KASPER: 2-2 the count, Hendricks sets to fire. CALLED strike 3! The inning is over and… it seems that Contreras has also turned the ball into a flock of doves! LEN KASPER: I think that’s Flock of Seagulls, JD. JD: I’m on a quart of Nyquil right now, Lenny, give me a break. Defenders of the human-called strike zone are the baseball equivalent of parents who say “life isn’t fair!” to defend solvable problems they’re too lazy—or let’s say, “old school”—to solve. Yes, not everything is fair, but we could be more fair, right? The most frustrating part to me is that umpires don’t seem to be getting any better, and I’m not even sure what incentive they have to improve. They’re among the least accountable groups in all of major sports – the worst ones last forever and still get high-end assignments regularly (Joe West has made the World Series more times than the White Sox, 6-5), and unlike literally everyone else involved with the game, they never have to face the press for their mistakes. In general, regardless of what my hours spent on my PS4 may tell you, I’m team humans > machines. But in this case, we have humans who aren’t earning it, so if they’re not willing to improve, then bring on the robots, baby! The umpire whose strike zone makes even Kris Bryant go emo. And sweet merciful Jehovah, I had no idea that Joe West has more World Series appearances than the White Sox. As with our South Side neighbors, I fully support the idea that anytime MLB assigns Cowboy Joe to the Fall Classic, the host city’s fire commissioner should respond by turning on the air raid sirens. More to the point, I’m tired of Contreras getting dragged because the one part of his game that needs improvement revolves around umpires not doing their jobs. Even after trying to make adjustments to his framing this spring, his numbers have drastically worsened as his -9.1 framing runs have led to an ugly -7.5 FRAA thus far in 2018. Meanwhile, his throwing runs (0.1) and blocking runs (1.6) are both average to good. So he does everything right except, as you say, fraud. Good quality in a person, bad quality in a catcher. 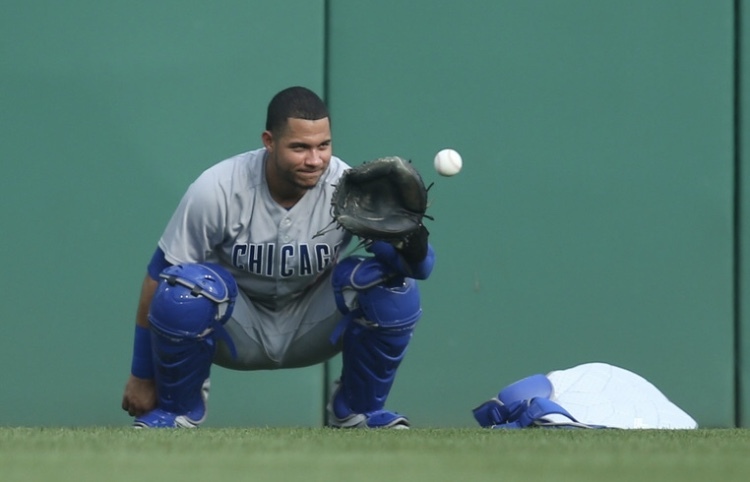 And Willson is not a bad catcher. But his inability to manipulate the Jordan Bakers of the world is making him appear to be one. That makes me feel like… well… Willson Contreras reacting to a Jordan Baker strike zone. That link is a good reminder that Willson can pimp an ejection as well as he can pimp a homer (or a double, or a walk), and as fun as that can be sometimes, it would be nice to see him have less “intangible” BS to deal with back there. I fully believe that Willson is working to be the best pitch framer possible, but all you need to do is to look at his Twitter fave history to see that he has, in some situations, been dealt less than an ideal hand there. Some things are just going to be unquantifiable—leadership, “clutchiness,” the magical properties of a relief pitcher turning his hat ever so slightly to the left—but what should be super tangible is what a friggin’ strike is. How close do you think we are to that? I’d love to know, because I’m trying to limit things to get unreasonably angry about and it would be great to cross something off and get into the quadruple digits. Apparently right now, robot ump technology is essentially answering the question: “What if CB Bucknor were made of liquid metal?” But if and when we get to the point where Statcast is even an incremental improvement over human umps, I say go for it and make the replacement immediately. Because with machines calling balls and strikes, we know that MLB’s tech people will always be working to enhance Statcast’s precision, and over time it should only get better. Given how much framing influences today’s game, you cannot possibly say the same thing for the current crop of umpires. I reiterate… Ángel. Goddamn. Hernández. The mistake is to think that adherence to an impartial and invariant set of rules on k-zone necessarily maximizes fairness, or fan and player satisfaction. AS someone who is deeply invested in the technology sector – the idea that assisted zone calling isn’t “ready” is total BS. Even using CURRENT Pitchtrax to give umpires instantaneous audible “in” or “out” – would dramatically improve on 30+% of missed calls on close strikes/balls. Beyond that – optic recognition is so advanced, a SATELLITE can identify human features from over 10,000 feet. Trust me – there is more than enough – with correctly placed cameras – to currently provide calls/strikes to within a 1% error – FAR and beyond better than what is currently called. Moreover, with slight adaptation to currently manufactured baseball, a hidden layer of isotopes, magnetic coating or other materials could be added (leaving the structure and surface of the balls untouched) that would allow tracking the ball TO THE MICRON. If also embedded on players cleats and gloves, and playing field fixtures (like bags and homeplate) you could instantaneously determine ALL tagging, running, fair/foul plays as well. I’m tired of hearing this BS that technology isn’t advanced enough. It is either MLB itself, the union or MLB’s fear of the union- maybe even cost – which is holding back the game from TRULY increasing pace of play and making it far more enjoyable for the fan and players. Imagine how much better rewarded GREAT command pitching would be!! !